include 20% off items and MORE (see marked items in-store). Be sure to stop in even if not on shop hop to take advantage of our SALE! Bright colors of batik fabric in 2 1/2 inch strips are the springboard for our 2017 Shop Hop project. After purchasing a starter kit at each of the seven (7) participating shops, see below, you will have a complete jellyroll. 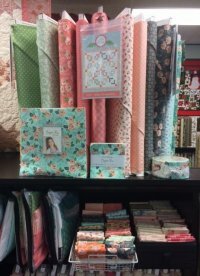 All you need to do then, is choose your favorite finishing kit from a participating shop and you are ready to SEW! This year's grand prize is a Rachel Baby Lock Sewing Machine with case, arm extension, walking foot, 12 extra bobbins, cutting mat and a Splash rotary cutter. Grand prize valued at $974. Be sure to pick up your passport booklet at your first shop visited! Please note that passports must be stamped by all participating shops. Incomplete passports are not eligible for prize drawings. If you have questions contact a participating shop for more information or visit http://www.prairiestarsquiltshophop.com. 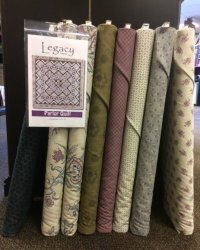 If you're looking for the latest quilt patterns and fabrics, you'll find them here! 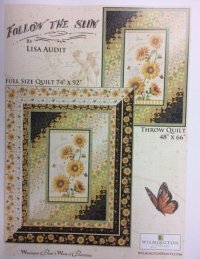 At Prairie Flower Quilt Co., the most recent designer fabric and patterns will be featured via email, so you'll always know when we have something new in stock. 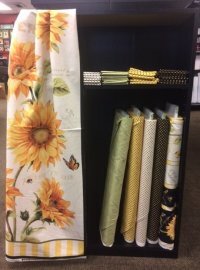 You'll find a vibrant selection of unique sewing patterns and fabric that'll help jump-start your creativity. 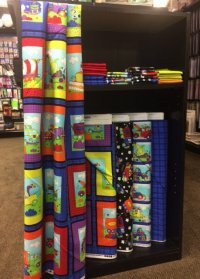 Check out the new fabric lines below.